The “trusted” sources Christopher Steele said he used in composing the Trump “dossier” have become a lot less reliable since the ex-British spy was called to defend himself in a libel lawsuit. Congressional Republicans are now “demanding that the FBI explain how the deeply contested, Democrat-financed document took on such importance in a major government investigation,” Rowan Scarborough wrote in a Dec. 20 report for The Washington Times. Steele had “bragged to Mother Jones magazine that he started the Mueller investigation by convincing FBI agents about the credibility of his dossier,” Scarborough wrote. In the dossier, Steele stated that an “extensive conspiracy between Trump’s campaign team and the Kremlin” existed. One memo in the dossier also claimed that the Kremlin had compiled enough financial and personal information on Trump that it could blackmail the Republican nominee. Steele wrote that Paul Manafort, Trump’s former campaign manager, and a campaign volunteer, Carter Page, orchestrated the campaign with Moscow to meddle in the 2016 election. He also maintained that Michael Cohen, Trump’s attorney, traveled to Prague in August 2016 to meet with Russian President Vladimir Putin’s personal staff and orchestrate a cover-up of the campaign’s hacking conspiracy. “All of those charges have been denied, and none has been confirmed publicly by a press leak or congressional inquiry,” Scarborough noted. Steele has accused Gubarev of being pressured by Russian’s FSB intelligence service to take part in hacking against the Democratic Party. A question from Gubarev’s legal team asked about the lengths Steele took to brief American reporters during the 2016 campaign. At the request of Fusion GPS, the investigative firm hired by Democrats to handle and pay Steele, the former spy said he briefed The New York Times, The Washington Post, Yahoo News, The New Yorker and CNN in person. He later briefed Mother Jones magazine via Skype. Steele said he told journalists that they may not quote his research. 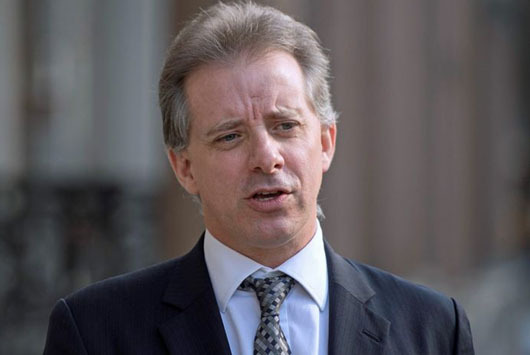 He “understood that the information provided might be used for the purpose of further research, but would not be published or attributed,” Steele said through his attorney. Steele also acknowledged that his final December memo, the only one that dealt with Gubarev, contained information he never vetted. “The contents of the December memorandum did not represent (and did not purport to represent) verified facts, but were raw intelligence which had identified a range of allegations that warranted investigation given their potential national security implications,” he wrote. BuzzFeed posted the complete Steele dossier on Jan. 10. Gubarev is suing the online news site for libel in federal court in Florida and wants to know who supplied the dossier to BuzzFeed.